Casquette and Pedal Sri Lanka have teamed up to create a brilliant Sri Lanka cycle tour package from 9th to 23rd March 2019 that incorporates all the things a passionate rider could wish for. That means great routes, spectacular sights along the way, fantastic foodie pit stops, an incredible support team, the chance to take a dip after every day’s riding and amazing once-in-a-lifetime experiences, such as riding next to elephants. Take a look below at the day-by-day itinerary and get in touch if you fancy coming along (details at the end of this page). You can also read our review of the excursion here for more colour on what to expect. With its tropical beaches, luscious tea plantations, amazing wildlife, soaring mountain ranges and amazing temples, Sri Lanka combines the perfect blend of luxury, culture and adventure to make it an ideal location to explore by bike. Starting next to the idyllic waters of the Indian Ocean, we’ll head inland towards the cultural capital of Sri Lanka; Anuradhapura. After a day exploring the enormous ancient stupas (the largest ancient wonders of the world after the pyramids), we will then ride south towards the Dambulla Golden Buddha and Sigiriya. Next up is the paddy fields of Sigiriya, where we will get the opportunity to ride to the Sigiriya rock fortress of the ancient Sri Lankan kings and safari with herds of wild elephants in nearby Minneriya national park. Continuing south, we leave the flat plains of the north behind us and begin to climb high into the southern mountain range. Passing through Kandy (stopping off to visit the Paradeniya Botanical Gardens and Golden Tooth Relic Temple), we spend the next 3 days cycling Sri Lanka’s incredible mountain roads, where we wind our way through untouched wilderness and expansive tea plantations. Tea and cake will be obligatory. We then descend after two days in the mountains through the Ella Gap (this is spectacular). The final few days of our trip will include a world-famous leopard safari in Yala national park, a visit to a turtle sanctuary, a wander through the immaculate streets of Galle, and mile upon mile of pristine golden sand beaches lapped by the warm waters surrounding the island. Awesome! Arrive into Colombo International Airport and transfer to our beach hotel in Negombo. Spend the afternoon building your bike, taking a swim in the Indian ocean or even going for a quick spin around town. A tough but flat acclimatisation day should ensure that everybody gets the chance to brush off any cobwebs and recover from the jet lag as quickly as possible. This route will take us along Sri Lanka’s stunning northern beaches, through rural farming communities and to the magnificent Murugan Hindu Temple. Today, as with every day, you can ride for as long or short a distance as you like and our support vehicles are always available to stop cycling when you want to. After a long ride on our first day, take the chance to recover and spend the day discovering the UNESCO World Heritage site of the Sacred City of Anuradhapura. Visit the world famous stupas (the largest ancient wonders in the world after the Egyptian pyramids), as well as taking in some shade beneath the Buddha’s bodhi tree - a sacred site which the Sri Lankan’s maintain is the oldest tree in the world. Back on the bike after our rest day, we should cover most of our distance relatively quickly. A flat ride on quiet roads will allow us to arrive in plenty of time to visit another UNESCO World Heritage site at the Dambulla Golden Buddha. While the name gives an idea of what’s in store, the scale and beauty of this cave temple complex really has to be seen to be believed. The complex of five caves with over 2000m² of painted walls and ceilings is the largest area of cave paintings found in the world. The caves also contain over 150 rock statues of Buddha. The second cave is the most elaborate and spectacular of the five and is the largest at 170ft long, 75ft wide and 21ft high. There is a large reclining Buddha statue and statues of two kings, Valagambahu and Nissankamalla. With sunset approaching, we will ride the final 15km of our journey along a stunning stretch of road running alongside an enormous natural reservoir, before arriving at our beautiful and secluded hotel set out in the surrounding paddy fields. With fewer miles to cover, there’s no need to be concerned, we’ve still got an action-packed day to savour. After a relaxing morning to make the most of a gorgeous pool at our hotel, we’ll head off towards one of the most famous landmarks in the entire country, Sigiriya Rock. This ancient rock fortress, which has been inhabited since prehistoric times, served as the palace for King Kashyap and was at one stage the capital of the Sri Lankan monarchy. Take a walk to the top with the group, and experience the view that greeted those ancient rulers every morning. After the fortress, we’re off riding again, although this time we’re heading towards a touch of nature. Just a few miles up the road we find a national park and wildlife reserve, where we will take a safari to view the herds of wild elephants roaming the countryside. Today we head south towards the mountain ranges of central Sri Lanka and a little of every cyclists favourite… climbing! A gradual and steady ascent will allow you to gain those vertical meters with limited effort, so Stravas at the ready. We’ll also break up the day a little with a visit to a traditional Sri Lankan Spice Garden. Reckon you could point out cardamon in the wild? Think you know your turmeric from your tamarind? Well, you should by the end of the visit. At the end of the day we’ll climb up into the idyllic lake town of Kandy. Formally the capital city during Sri Lanka’s colonial days, and our home for the next two nights. Halfway through our tour, we think you’ve earned yourself a day off, and Kandy is the perfect place to enjoy it. We have a relaxing morning visit to the Paradeniya Botanical gardens. These are the largest Botanical gardens in Asia and also the home to a huge flock of giant fruit bats, also known as flying foxes. The rest of the day is your own. Visit one of the most important sites in Theravada Buddhism (the Kandy Tooth Relic Temple), take a jog around the lake or simply soak in the Sri Lankan vibes in the local market. With the legs refreshed after a rest day in Kandy, heading further south and further into the mountains, day 8 is one of our biggest climbing days. Fortunately, we have plenty of incredible sites along the way to break up the climbs, ranging from an old colonial officers mess, the majestic Ramboda waterfall, and a fully functioning Sri Lankan tea plantation and tea factory visit. Throw in a couple of stunning views of this luscious tea-growing region along the way, and by the time we reach our summit in Nuwara Eliya, 2,000m above sea level, you’ll be ready for a hot shower and soft bed in our stunning mountain hotel. 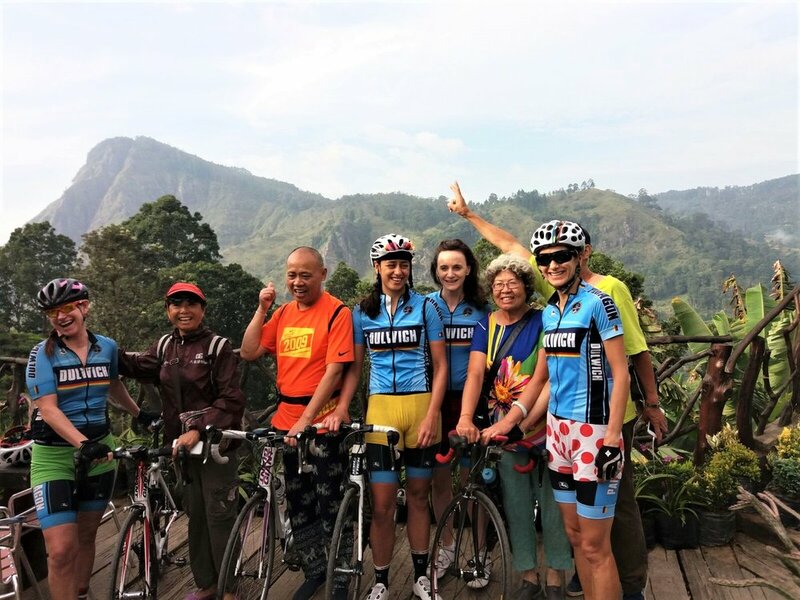 We’ll start with a beautiful 25km descent out of Nuwara Eliya, back into the sublime rural countryside and tea plantations of Sri Lanka’s southern mountain ranges. We then have a climb back up to reach the mountain town of Haputale: famous for being the town with one of the best views in the world! At 1400m above sea level, Haputale is built on the side of an escarpment that immediately drops almost the entirety of that height down into the southern plains of Sri Lanka! After soaking in the views with a hot cup of chai, the climbing resumes as we wind through quiet mountain roads before a long and pleasant descent to the lovely trekking town of Ella and our rest stop for the evening. With the majority of the tour’s climbing now completed, there is plenty of reason to celebrate. After breakfast, we’ll descend over 30km through the Ella Gap, passing the spectacular Rawana Falls, into Wellawaya town. 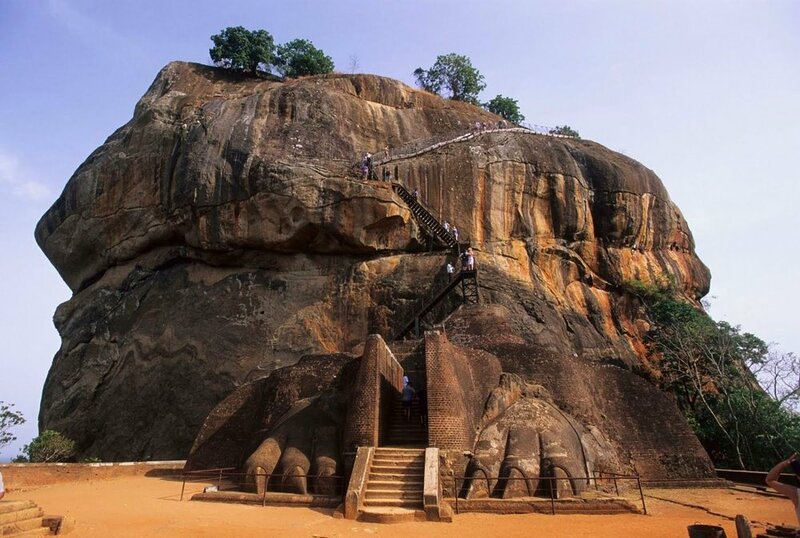 From Wellawaya, it’s a fast and gentle descent all the way to our into Tissa, with a quick stop off at the Buduruwagala 8th century statues, the tallest rock Buddha statues in the world. After a quick shower (and a swim, of course) we start our Safari in Yala National Park - one of the most popular safari spots in the sub-continent - where we hope to see leopards, elephants, crocodiles, buffalo, jackals, eagles and tons of other amazing wildlife. After a week and a half, we’re back onto the coastal road and it’s a belter! We start our day with a visit to one of Tissa’s ancient dagobas, before riding to the delightful port and beach side town of Tangalle. After a quick bite to eat, we continue along the stunning shoreline of the Indian Ocean, before arriving into our beach side hotel in Mirissa with plenty of time for a quick dip in the pool or the sea before dinner. Continuing along the coastal road, it’s not long before we reach the Dutch fort town of Galle. A UNESCO World Heritage site, this immaculately kept colonial settlement is about as close to stepping back in time as it’s possible to come. After a walk around the settlement ramparts and top-class coffee, we’ll be back on the bike heading towards our next stop and a tour favourite: turtles. Kosgoda Turtle Hatchery has been rescuing turtles along Sri Lanka’s east coast for over 30 years. Here, you can explore how the incredible volunteers ensure that these endangered animals have the best chance of survival in the wild. We’ll then roll into Kalutara, where we will spend the night in a fabulous local hotel on the beach, of course. Our last 100k ride from Kalutara back to where we started our adventure, by the beach in Negombo. Enjoy the afternoon relaxing by the pool with a beer or two… you’ve earned it. Put your feet up and relax. Negombo is the ideal location to spend an afternoon catching up on some holiday reading, swimming in the warm waters of the Indian Ocean, or doing some last minute souvenir shopping for loved ones before you fly home. How intense is the trip? Our Casquette Sri Lanka trip is both a tour of this spectacular island paradise and a lovely warm way to get some early season training in. We see it as an opportunity to test your cycling legs at whatever speed you want to cycle. Each day is designed to allow you to either ride the full distance or just a part of the day. Some days are more challenging than others and if you don’t want to cycle at any time, simply place your bike in our support wagon and take a ride in our air-conditioned bus. On most days we will finish our rides by mid-afternoon, with enough time to relax by the pool, have a massage or see the local town and historic sites. The Casquette Sri Lanka tour is from Saturday 9th March - Saturday 23rd March 2018. You’ll need to arrive into Colombo by the evening of Saturday 9th March (i.e. before the first scheduled day of riding), when we’ll hold a full tour briefing and set up everyone with their bikes and kit. November to April in Sri Lanka are ideal for cycling and the best time of year to visit the country. Average highs top out at around 32°C in Colombo and 25°C in the old mountain capital of Kandy. Bringing your bicycle to Sri Lanka is convenient and hassle free. We would highly recommend that you get a bike box when bringing your bike on the plane with you. It is possible for us to arrange bike hire for you in Sri Lanka for an additional fee, but as with most long rides, it’s often more comfortable if you have your own. Placed on the ancient trade routes between the east and the west, Sri Lankan food has influences from all over the old world, and we know that you’ll find it a real highlight of your trip. Breakfast, cycling snacks, lunch and water are included in the cost of the trip. We will also provide you with dinner at our hotels after our tougher days of riding. Most nights we will allow you to explore the food scene at your leisure, and our guides will always be happy to give you their local recommendations. 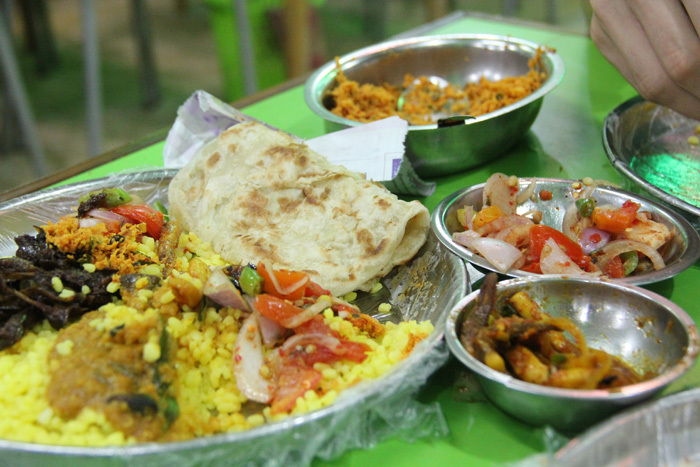 Most Sri Lankan food is suitable for vegetarians and vegans, and gluten free food is available on request. If you have any special dietary requirements, we will do our utmost to accommodate, so please do let us know in advance. Casquette readers get a reduced price of £1,999 for twin/double shared (usually £2,499) and £2,199 for single occupancy (if you aren’t keen on sharing - usually £2,699). To book your place on this Casquette flavoured Sri Lanka cycling trip, visit Pedal Sri Lanka and put the word ‘CASQUETTE’ in the message box to secure your discount. Dates are 9th to 23rd March 2019.